Home > G-sleeve Art > "Being a Kid" Prints by David > "Darn Acorn"
The "Darn Acorn" print is one of nearly 100 vignettes in the "Being a Kid" series drawn from the boyhood experiences of the artist, David Gildersleeve. This print is based on "actual" events. Click image to enlarge. Not all experiences as a kid are happy, but they can be memorable. And if we allow ourselves to reflect on the experience in a positive way, it can be a valuable lesson for the future. Speeding down the sidewalk on his skateboard is thrilling as the kid exercises control and skill in going from here to there (it doesn’t matter from or to where). But when a wayward acorn on the walk ahead causes an instant redirection of the board while the kid is headed elsewhere, the result is not pleasant. It causes scrapes and bruises, and he gains tender loving care from Mom, but there is also a commitment to more carefully guide the skateboard around acorns in the future. This print (11" x 17") is foam-core backed and suitable for framing, and is perfect for hanging in a boy's room. 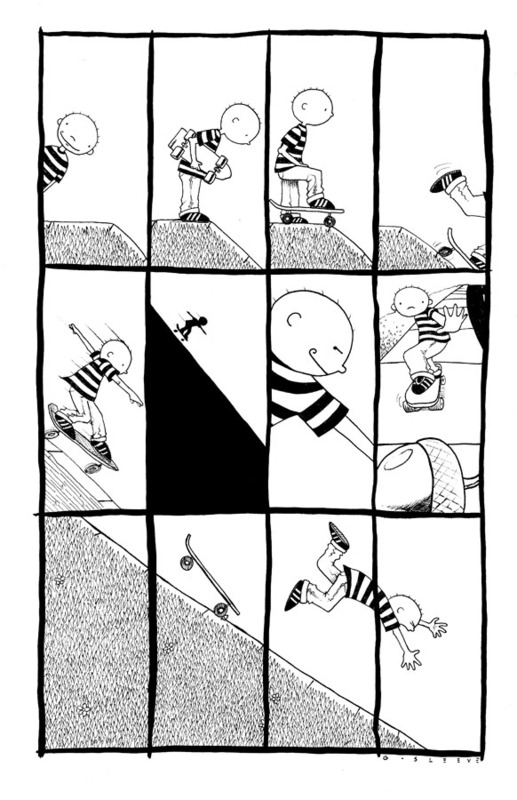 Skateboarders have all had this experience and shared in the kids resulting hurt. And perhaps you might have also, and you might be able to say – "I was once that boy!"